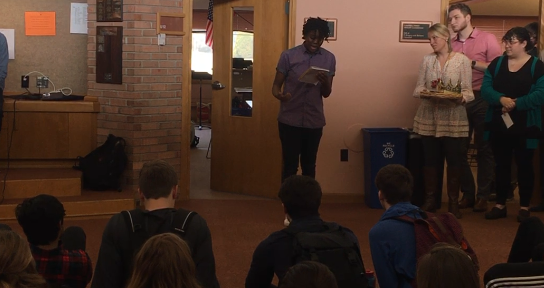 Earlier this month, a pair of Prairie students traveled up to the JCPAA Arts Studios in Milwaukee to compete in Voltage, a spoken word competition for teens ages 13-19. Competing in the final Grand Slam Qualifier, Senior Anna Pegurier and freshman Jasmine Roach performed two original pieces in front of a packed house. Jasmine placed 2nd overall and will be moving on to the Grand Slam on March 4th where she will be competing for a coveted spot on the team that will travel to San Francisco this summer to represent Milwaukee in the Brave New Voices International Youth Poetry Slam Festival. Voltage is part of Milwaukee’s Still Waters Collective series. This entry was posted in All News, Featured, Performing Arts, Upper School by Brendan O'Brien. Bookmark the permalink.